Instead of Manhattan Street Merch today, I'm posting Flea Market Merch from Georgia - I was too excited to wait any longer. 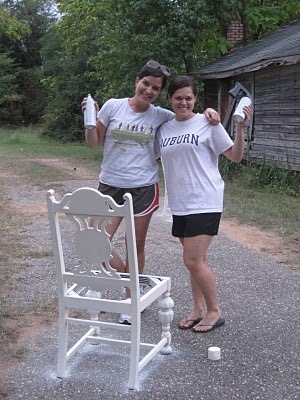 As I've mentioned, I was in Alabama about a month ago helping a good college friend with her new house. We swung through Scott's Flea Market in Atlanta on our way back to Alabama and found some GREAT pieces. 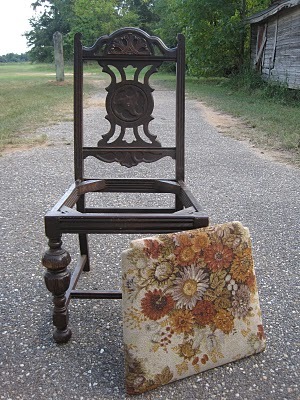 My favorite - a pair of chairs. It was late in the day and really hot when we found them, so I'm not sure the woman selling the chairs new what she was doing.... She sold them to us for $20 - for the pair! This receipt makes me laugh. Here they are. Overloaded with character and potential! They were in great shape. The woodwork was beautiful and the seats were detachable. Thank goodness. Oh what lovely scratchy old fabric. Ick. First things first. We prime. Then we paint. 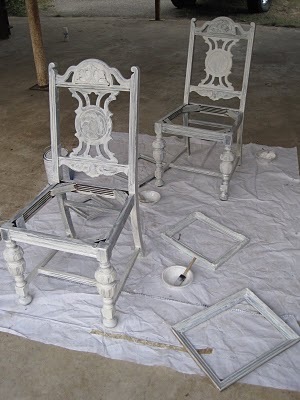 2 cans of Antique White Satin Spray Paint. 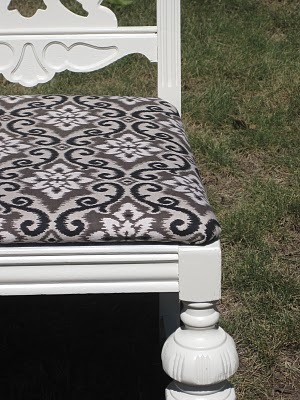 We went fabric crazy at Joann's and decided on a black, white & gray damask meets ikat pattern, which you can see below... On our FINISHED CHAIRS! This is the country for you. Cotton fields and dogs in the background. 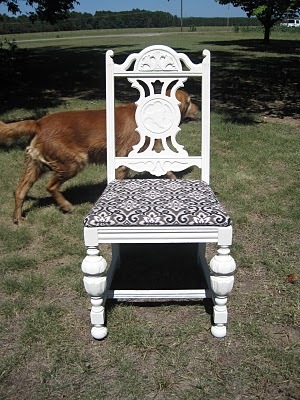 I love how these chairs turned out! Next round, I'll show you the room where these chairs are now living!